I visited Weston Super Mare a couple of months ago. I’d been there before with my parents, but couldn’t remember much about it. Apparently it was raining. It was much nicer on this visit. We arrived fairly early, or at least before the bulk of the tourists arrived. That meant that for a short while the beached were fairly empty and there wasn’t a queue for the donkey rides. The donkey my daughter went on was paired up with a trainee. The trainee donkey was allowed to the experienced one up and down the beach at leisure. That enabled me to get this shot of the pony almost alone with the pier. The Grand Pier was almost destroyed by a fire in 2008, but has since had Â£34 million spent on a refit. I’m always interested in what other piers offer in comparison with what Hastings Pier used to be. At 400m in length it is bigger than Hastings Pier. The Grand Pier met my expectations by being mainly arcades and sweet shops. At the end there is considerable space for functions and a couple of restaurants. You are charged a couple of quid to get on there too. As for Weston Super Mare itself, it is everything you would expect a popular seaside resort to be and nothing more. It has a nice sandy beach, but other than that everything on offer feels very similar to that at Hastings. It doesn’t have the history that Hastings does, nor the fabulous old town. These photographs can be viewed full size on my Flickr page by clicking on them. Hastings Pier, was dubbed the Peerless PierÂ by the Earl of Granville when it opened in 1872. He was right. Even without the superstructure it looks great. Repairs to it are ongoing with it expected to be open in 2016. By the time it is finished an estimated 72k meters of new timber will be laid plus 500 deck beams and 350 girders replaced. You can keep up to date with the progress being made on the official website. Low tide is a great opportunity to photograph the pier at its best. The wet sand provides great reflections. If you are lucky an obliging seagull will help to add to the scene. These photos of the peerless pier can be viewed full size on my Flickr page by clicking on them. This week’s photo is of Hastings Seafront.Â This was taken on the same day as my recent Black and White post. The haze present on that sunny evening softened the details in the distance, whilst the sun glints off the cars and buildings. You can view this image of Hastings Seafront full size on my Flickr page by clicking on it. The St Jude Storm of 2013. A storm expected to be so powerful that it was named after the Patron Saint of Lost Causes. Not even the storm of 1987 was given a name until after it had passed, and the devastation it had wrought discovered. Perhaps that’s because we didn’t know it was coming. Forecasters, aware that they had failed to predict the Great Storm, made sure they warned everyone well in advance this time. They laid it on thick. The media fueled the fear, latching on to the opportunity to fill column inches and 24 hours of news broadcast. A sense of foreboding built up. Windows rattled in the strengthening winds and squally showers. Something big and bad was coming. In the end, it wasn’t anywhere near as bad as it was made out to be. Not that is any comfort to the relatives and friends of the four people who died as a result of it of course. In truth I was disappointed. I woke up early and got out to take some photos before going to work, expecting (hoping) to see downed trees and beached ships. I actually saw one wheelie bin, a broken fence and lots of twigs. I’m always drawn to the seafront during stormy weather. I’d decided this time round to park on the West Hill and take some photos of the beach and Harbour Arm from a distance. There were quite a few photographers down on the beach already. The waves were smashing against the Harbour Arm dramatically, but not much more so than I’ve photographed before. And the wind was easing. The forecasters were consistent in saying that the winds would gust up to 80 mph. That is a high speed, but nothing nearly as destructive as those of the Great Storm that blew at a consistent 80 mph with gusts even higher. I think the warnings about the St Jude Storm were over egged somewhat. There is a need to warn the population about incoming bad weather. This helps people secure their property and prepare for travel disruption. However there is also a need for some perspective to be shown. The St Jude Storm was never going to cause damage on the scale of the Great Storm. As usual the media blew everything out of proportion. These photos can all be viewed full size on my Flickr page by clicking on them. Can there be such a thing as too many pictures of Hastings’ ruined pier? It appears in my photos quite a lot. Hopefully it won’t be a ruin for much longer so I suppose it’s important to capture images of its current state. You can view a larger version of this image by clicking on it. You’ll be taken to my Flickr page. Like the Harbour Arm, Hastings Pier is also under constant pressure from the sea. Yet although the pier seems much frailer than the solid concrete harbour arm, it relies on clever design rather than brute strength.Â The core structure of the pier has stayed pretty strong since it’s construction in 1872. In its original design the end nearest the shore was forked. This design helps to break up the waves during heavy seas. The architect, Eugenius Birch, created a screw system to ensure that the pilings provided the strongest support for the structure. He applied it in all of the 14 piers he designed. In 1898 Hastings Pier produced a net profit of Â£3612,. 3s 9d which is roughly the equivalent of Â£360,000 in today’s money. Could that happen after the pier reopens in 2014? Any profit would be a great achievement. Hastings Pier is looking for sponsors to help support its redevelopment. You can adopt a plank by clicking on this link. View this picture full size on my Flickr page by clicking on it. I liked this particular perspective of Bottle Alley and Hastings Pier. Where the vanishing point of the alley intersects with the entrance to the pier. There was good news for Hastings Pier in November when the Heritage Lottery Fund awarded 11.4 million towards the total project cost of 13.9 million. 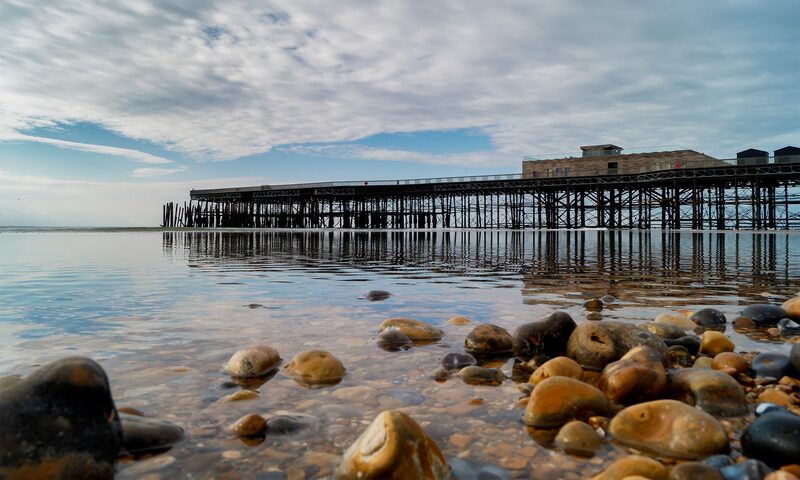 The Hastings Pier and White Rock Trusts’ aim is now to have the Pier restored by the end of 2014. The good news is that they plan to have a quality restaurant at the end of the Pier. I reckon I can claim credit for that idea as I suggested it in one of my first blog posts about the pier. Ryde Pier on the Isle of Wight is the 681m pier from which you can catch the Wightlink Catamaran for theÂ 20 minute journey to Portsmouth. The original pier was built during 1814 so that visitors to Ryde didn’t have to walk across the sand to get to the town. Two parallel piers were built along side, one for a tram service in 1864 and another for a train service in 1880. The train service still operates but the trams stopped operating in 1969. Ryde itself is not known for much other than being the place where a large number of the 600 people drowned in the sinking of HMS Royal George in 1782. The bodies were buried in a mass grave where the Esplanade is now. A memorial plaque to the disaster was unveiled belatedly in 1965. Ryde Pier is nice and straight so offers the opportunity for some perspective pictures. These were taken between some very heavy showers of rain. You can click on the images to view them full size on my Flickr page. You can view more posts about the Pier here.